Did you know that it’s Banned Books Week? It is. 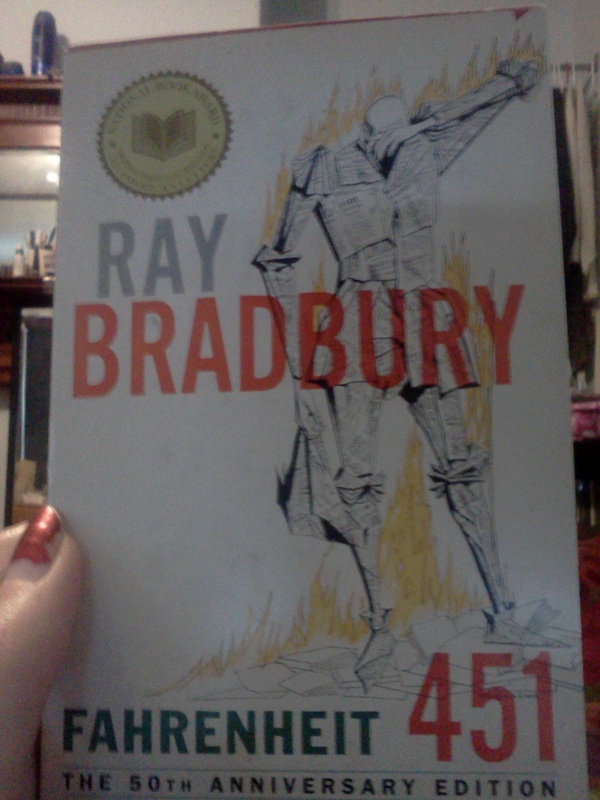 I’ve had this copy of Fahrenheit 451 since I can’t even remember when. I might have bought it from my college bookstore during my undergrad years, or I could have found it on my brother’s bookshelves (and, you know, he wasn’t using it…). But I have never read it, somehow. A little surprising, in all my years of studying literature. A lot of people read it in primary/secondary school, before going on to college, but it was never required reading for me. A few months ago I came across an excerpt from this book on some website, and it was bumped much higher on my reading list, but I wanted to finish some other ones first. But I know this book has been/is banned in many places over the years, and it’s pretty short, so it seemed the perfect option. For those of you who want to participate with an easier option, you could always read Harry Potter, or a number of children’s picture books that were/are banned (like And Tango Makes Three, a book with gay penguins that is really just about love and acceptance). There are many lists of banned books online you could browse to find one to read. And you can read them any time, not just this week! Have fun being a rebel. 50 anniversary edition, how special. This entry was posted in about reading, blog and tagged banned, books, censorship, fahrenheit 451, ray bradbury, reading, rebellion. Bookmark the permalink.